The Global Volcanism Program has no Weekly Reports available for Yakedake. Yakedake rises above the popular resort of Kamikochi in the Northern Japan Alps. The small dominantly andesitic stratovolcano, one of several Japanese volcanoes named Yakedake or Yakeyama ("Burning Peak" or "Burning Mountain"), was constructed astride a N-S-trending ridge between the older volcanoes of Warudaniyama and Shirataniyama. Akandanayama, about 4 km SSW, is a stratovolcano with lava domes that was active into the Holocene. A 300-m-wide crater is located at the summit, and explosion craters are found on the SE and N flanks. Frequent small-to-moderate phreatic eruptions have occurred during the 20th century. On 11 February 1995 a hydrothermal explosion in a geothermal area killed two people at a highway construction site. Miyake Y, Ossaka J, 1998. Steam explosion of Feburary 11th, 1995 at Nakanoyu Hot Spring, Nagano Prefecture, central Japan. Bull Volc Soc Japan (Kazan), 43: 113-121 (in Japanese with English abs). Murai I, 1962. A brief note on the eruption of the Yake-dake volcano of June 17, 1962. Bull Earthq Res Inst, Univ Tokyo, 40: 805-814. There is data available for 38 Holocene eruptive periods. There is no Deformation History data available for Yakedake. There is no Emissions History data available for Yakedake. Yake-dake, whose name means "Burning Mountain," rises above the popular resort of Kamikochi in the Northern Japan Alps. It is seen here from Taisho-ike pond to its ENE. The small andesitic stratovolcano contains a 300-m-wide crater at its summit, and explosion craters are found on the SE and northern flanks. Frequent small-to-moderate phreatic eruptions have occurred during the 20th century from both summit and flank vents. 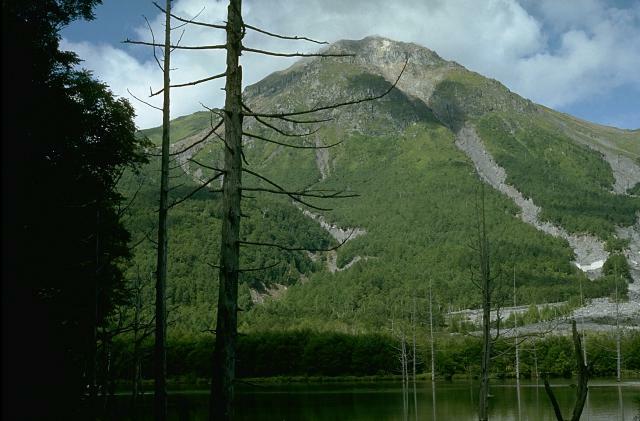 An eruption in 1915 produced a mudflow that created Taisho-ike pond and killed the trees in the foreground. 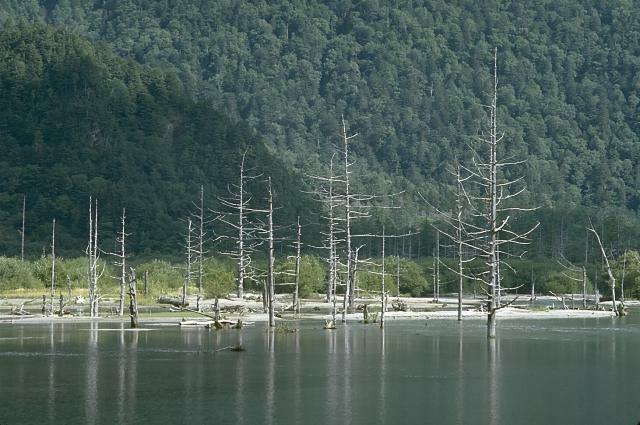 A mudflow during an eruption of Yake-dake volcano in 1915 dammed the Azusa-gawa river, forming the Taisho-ike pond, and leaving these standing dead trees. The 1915 eruption began on June 6 from a 1-km-long fissure that extended from the summit down the ESE flank. About 50 craters opened along the fissure, but the principal activity took place from the upper end of the fissure. There are no samples for Yakedake in the Smithsonian's NMNH Department of Mineral Sciences Rock and Ore collection. Large Eruptions of Yakedake Information about large Quaternary eruptions (VEI >= 4) is cataloged in the Large Magnitude Explosive Volcanic Eruptions (LaMEVE) database of the Volcano Global Risk Identification and Analysis Project (VOGRIPA).